(TibetanReview.net, Aug21, 2016) – A total of 72 members of the US Congress have on Aug 17 called on President Barack Obama to make concrete contributions on the issue of Tibet during the remaining months of his final term in office. 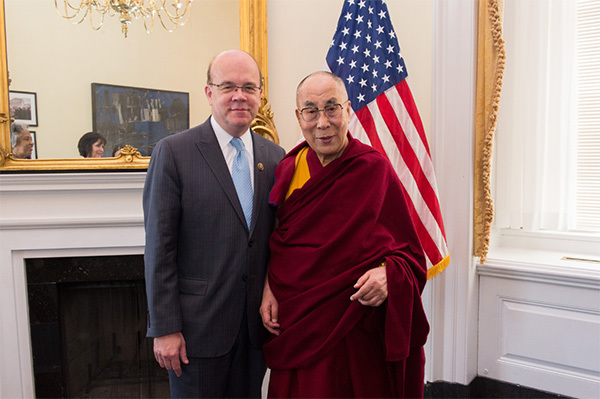 Led by Congressman Jim McGovern (D-MA), the House lawmakers have urged him to formulate “new, creative strategies to encourage meaningful dialogue, protect Tibetan rights, and preserve their unique cultural, religious and linguistic identity”. The Democratic Representatives who joined McGovern were Eliot Engel (NY), Ranking Member on the House Foreign Affairs Committee; Nita Lowey (NY), Ranking Member on the House Appropriations Committee; Betty McCollum (MN); Alan Lowenthal (CA); Ted Lieu (CA); Joyce Beatty (OH); Tim Walz (MN); Jim McDermott (WA); Michael Capuano (MA); Eleanor Holmes Norton (DC); Zoe Lofgren (CA); Bill Pascrell, Jr. (NJ); Richard Neal (MA); Joe Courtney (CT); David Cicilline (RI); Peter Welch (VT); Mike Thompson (CA); Loretta Sanchez (CA); Barbara Lee (CA); Lloyd Doggett (TX); Steve Cohen (TN); Dan Kildee (MI); Marcy Kaptur (OH); John Garamendi (CA); Doris Matsui (CA); Jared Polis (CO); William Keating (MA); Jose Serrano (NY); Nydia Velazquex (NY); Rosa DeLauro (CT); Louise Slaughter (NY); Chris Van Hollen (MD); Tim Ryan (OH); Luis Gutierrez (IL); Gerald Connolly (VA); Matt Cartwright (PA); Gene Green (TX); Jan Schakowsky (IL); Pedro Pierluisi (PR); Mark Takano (CA); Mark Pocan (WI); Michael Honda (CA); Steve Israel (NY); Andre Carson (IN); Peter DeFazio (OR); Sam Farr (CA); Donna Edwards (MD); Niki Tsongas (MA); John Yarmuth (KY); John Lewis (GA); Anna Eshoo (CA); Mark Desaulnier (CA); Jerry McNerney (CA); Charles Rangel (NY); Joseph Kennedy III (MA); Danny Davis (IL); Donald Beyer (VA); Bobby Rush (IL); Carolyn Maloney (NY); Keith Ellison (MN); John Larson (CT); Stephen Lynch (MA); Sander Levin (MI); Raul Grijalva (AZ); Albio Sires (NJ); Ann Kuster (NH); Jim Langevin (RI); Maxine Waters (CA); Joe Crowley (NY); Jerrold Nadler (NY); and Juan Vargas (CA).